The hand-painted perfection of Chinoiserie wallpaper at de Gournay. “Requesting the pleasure of your company for brunch in Paris” has such a nice ring to it, doesn’t it? This is especially true when the invitation comes from Claud Cecil Gurney, the founder of de Gournay, a brand known for sumptuous fabrics and the hand-painted perfection of their wallpapers. I made my way to rue des Saints-Peres feeling that pulse of anticipation in knowing I would soon be experiencing the exceptional, the fact that wallpaper was being hand-painted as we enjoyed delectable food bringing with it a deeper pleasure than I could have imagined. Hand-painting wallpaper is an art for which de Gournay’s craftspeople are indisputable masters. 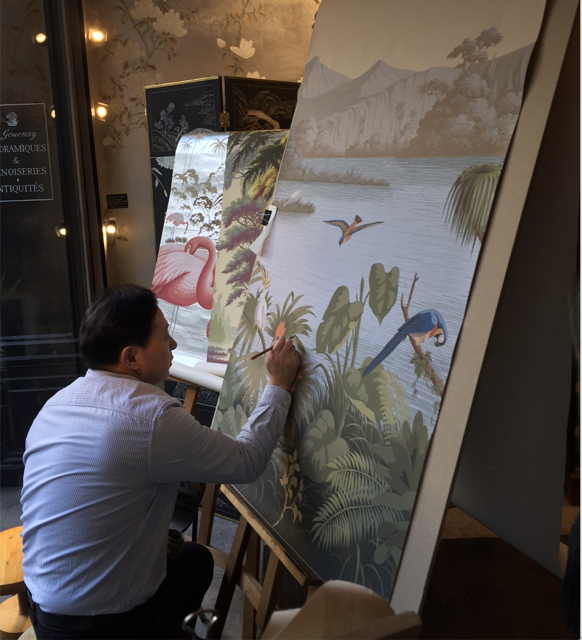 I was struck by the fact that hand-painted wallpaper has made a big comeback—so bespoke it made my heart sing as I watched the capable man making art, creating a panel that would grace the de Gournay Chinoiserie Collection! As a designer, I absolutely crave purity and have an insatiable desire for perfection, though what I mean as perfection is, often, represented by the imperfect influence of the human hand in handcrafted pieces. 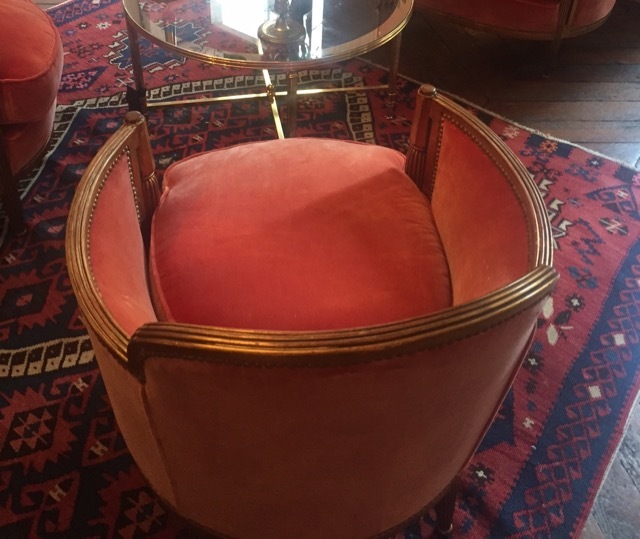 The velvet chairs were such a stunning color and the hand on the fabric was impeccable. The fabrics I experienced were just as stunning—the velvet so luxurious it fairly glowed. Taking it all in, it occurred to me that the excitement I feel for de Gournay is that the company understands that its mark is to help those of us who demand the best to realize our dreams when it comes to creating interiors. Whether our aim is to acquire a porcelain dinner service or 19th-century French papier peint, or to realize a Chinois-inspired room or a gold-leaf ceiling, each person who plays a part in bringing this company’s products to life is so highly skilled. 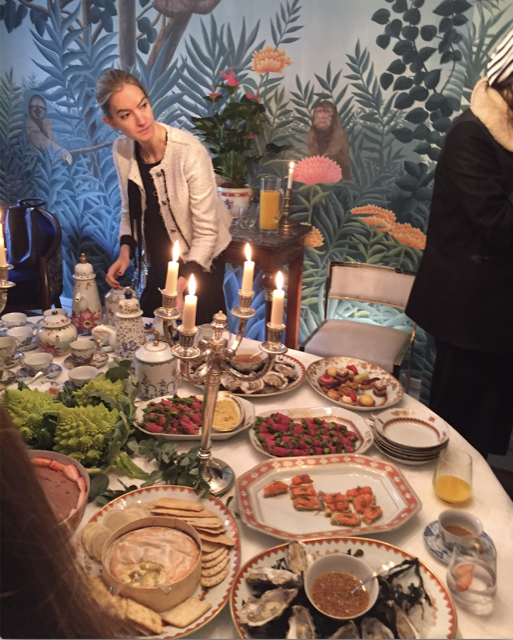 Also a gracious host, de Gournay melded the sumptuous backdrop with exquisite food to create a feast for the senses! A feast for the sense at de Gournay, both in terms of the backdrop and the exquisite food. Have you ever experienced a moment in life when a design element stopped you in your tracks for the memories it brought flooding in? This happened to me that afternoon when I spotted a cluster of glass flowers illuminating a section of beautiful salmon-hued wallpaper awash in tropical flora. It was a lamp reminiscent of one my mother bought when she redecorated the beach house in South Africa one year, her desire to bring the garden into the house the driving force for the elements she chose. 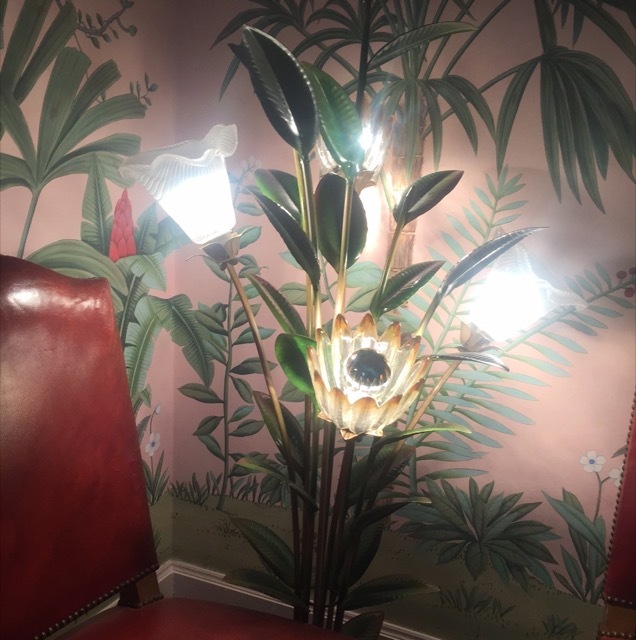 A flower lamp at de Gournay in Paris so reminiscent of the one my mother bought for our beach house in South Africa. 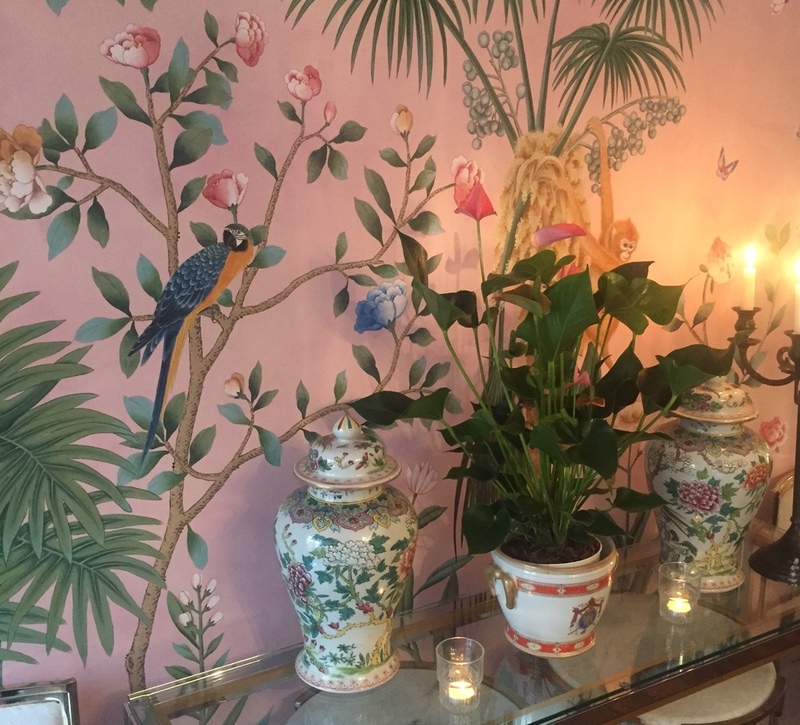 She brought the same panache into those seaside interiors with palms, parakeets and the brilliantly lit flowers on par with the graciousness de Gournay had created in their showroom. 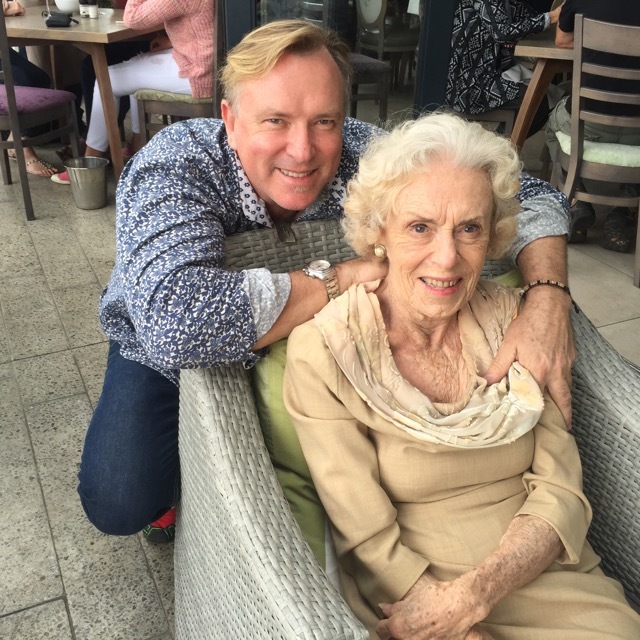 Thinking of her surrounded by such luxury reminded me of the dynamic influence she has been in my life. Her glamour and excellent taste a beacon as I developed my own sensibilities throughout mine. Bruce Andrews and his mom Sylvie. There is simply no substitute for authentic discernment, which she had and which I experienced surrounded by de Gournay’s opulence: truly a delight to the senses! This post, An Insatiable Desire for Perfection, © Bruce Andrews Design, all rights reserved. Our furniture is now available through Nandina Home in Aiken, SC; Jalan Jalan in Miami, FL; Travis & Company in ADAC in Atlanta; and the Ellouise Abbott showroom in Dallas, TX. We will soon be showing in the Ellouise Abbott showroom in Houston and in the Michael-Cleary showroom in Chicago, IL.